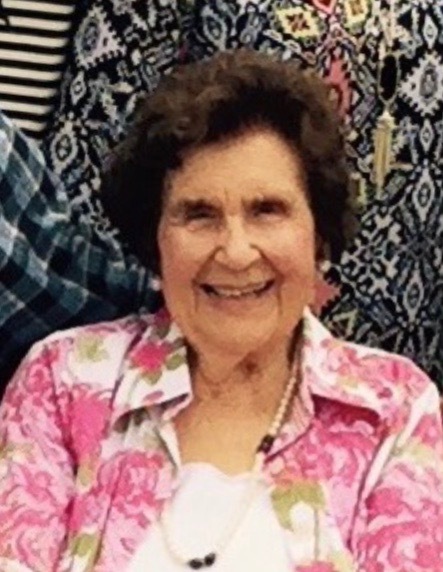 Gertrude “Trudy” Cieutat Waguespack, a native of New Orleans and resident of Baton Rouge, passed away on Friday, November 30, 2018 at the age of 92. She is survived by her five children and two grandsons. She was preceded in death by her parents, brother and husband. Trudy was born on March 29, 1926 in Arabi, Louisiana to Marie Amelia (Weinnig) Cieutat and Roland Ernest Cieutat Sr. She was their second child and the sister of Roland Ernest “Mike” Cieutat Jr. Trudy married Leonard Joseph Waguespack in 1950 and had five children: Gayle Ann Terwilliger (Gary), Leonard James Waguespack, Wendy Ann Waguespack, Carl Ernest Waguespack and Trudy Waguespack Nelson. She had two grandsons: Justin Paul Ivey and Martin Wall Terwilliger. She graduated from Louisiana State University at the age of 20 in 1946 with a double major in speech and mathematics. Upon graduation, she began a teaching career, which spanned more than 30 years. In her retirement, Trudy spent much of her life caring for her grandson Justin. She adored animals, looking after a variety of family pets over the years – the most recent being her beloved dog Tiger. She was an avid sports fan who spent countless hours watching the LSU Tigers, New Orleans Saints and Houston Astros. She had a great appreciation for theatre and enjoyed attending plays as often as she could. Trudy was an avid reader and civic-mind woman who remained politically engaged until the very end. She was a very devout Catholic who regularly attended multiple masses during a typical week and was staunchly dedicated to her faith. She often expressed a deep admiration for the intellect and spirituality of nuns and priests, especially Jesuits. Trudy was honored as a Golden Tiger, earning the title in celebration of the 50th anniversary of her graduation from LSU. She was one of the many New Orleanians displaced by Hurricane Katrina and spent almost all of her subsequent years in Baton Rouge with her daughter and grandson. She loved to reflect on her time in New Orleans and always held the city in the highest esteem. Trudy was a fighter to the very end. She made a point to let her family know how much she loved them as often as she could in the final year of her life and will be missed in a way that words cannot describe. Visitation for Trudy will begin at noon on Tuesday, December 4th, 2018 at JACOB SCHOEN & SON, 3827 Canal Street in New Orleans. Visitation will be followed by a Mass at 1:30 p.m. Interment will take place in Greenwood Cemetery.